Sunni Ittehad Council’s Pakistan Bachao (Save Pakistan) Long March has reached in Gujrat few moments ago. It was started from Rawalpindi/Islamabad yesterday and will reach Lahore. Sunni Ittehad Council Rally is traveling along GT Road crossing many cities; Rawat, Gujar Khan, Dina, Jhelum, Sarai Alamgir, Kharian, Lalamusa, Gujrat, Wazirabad, Gujranwala… This Procession will end up at Data Darbar Lahore. Purpose of this rally is to defend Namoos-e-Risalat Act and Acts about Khatam-e-Nabuwat. 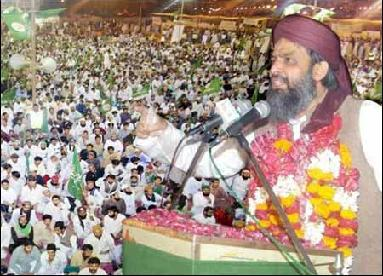 Sunni Ittehad Council Long March is lead by Sahibzada Fazal Kareem, Chairman of Sunni Ittehad Council. Other leaders of Sunni Tehrik e.g. Sarwat Ejaz Qadri are also participated in long march. Leaders of Sunni Ittehad Council delivered their speeches at different places. Sunni Ittehad Council was warmly welcomed in GTS Chowk Gujrat. Leaders of Pakistan Muslim League - Q e.g. Mian Imran Masood, Chaudhary Tufail Ahmed etc also welcomed the march on behalf of their party. Mufti Munib ur Rehman, Chairman Tanzeem ul Madaras Ahle Sunnat said that Government should not try to stop rally. He also said that Government should not alter Tahafuz-e-Namoos-e-Risalat Act. He was addressing to media in Karachi. Long march is now headed over to Wazirabad and then Lahore via Gujranwala.